Prepare for a riveting portrayal of some of the most exciting battles of ancient history as well as the tales of betrayal, lust, conquest and brutality that often accompanied them. 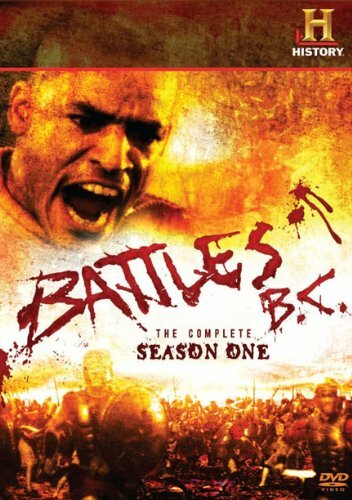 Battles BC, the exciting series from HISTORYTM, uses computer graphics and live-action stunts to bring to life the battle strategies, tactics, and weapons of past military leaders, from Hannibal and the Romans to Moses, the Athenians, and David. Caesar: Super SiegeThe episode titles offer a clue as to how Battles B.C. : The Complete Season One, a two-disc, eight-part offering from the History Channel, approaches its subject matter. “Hannibal: The Annihilator,” “Joshua: Epic Slaughter,” “Caesar: Super Siege”: this is definitely not the Classics Illustrated version of the exploits of these and other ancient warriors and biblical figures. In fact, the series is loud and kinetic, flashy and unsubtle, bloody and violent, with macho voiceover narration making liberal use of words like “slaughter,” “brutal,” “butcher,” and “exterminate” while hordes of swarthy, bearded men run each other through with swords and arrows, pillage towns and fortresses, and generally wreak havoc. This testosterone-fueled tone permeates most of the episodes. In “David: Giant Slayer,” King David of Israel is portrayed as “a bloodthirsty opportunist” and compared to a Mafia don, whose tale is one of “relentless ambition, violent murder, conquests on the battlefield… and in the bedroom” (the duel with Goliath, which took place about 1015 B.C., is depicted only briefly at the beginning). In the risibly-titled “Moses: Death Chase,” the Old Testament prophet revered by Jews, Muslims, and Christians alike is viewed as a great general, a master tactician, and one baaad man; the exodus from Egypt to Canaan is referred to as a “campaign” and explained in practical military terms (the parting of the Red Sea was apparently not quite the miracle described in the Good Book).